When most people think about springtime holidays, they immediately picture bunnies and brightly colored eggs. 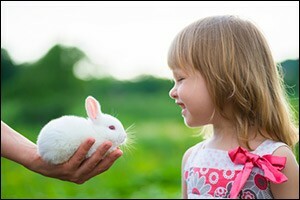 What better what to celebrate Easter with your small children than to adopt a rabbit? Unfortunately, there are many people who make this decision without doing any research into the care and feeding of small rodents as pets. Similar to a cat or a dog, ownership of any new pet should begin with a veterinary check-up at your local animal hospital in Dartmouth. Pet bunnies can live anywhere between 7-10 years or more with proper care and feeding. This is no small commitment. If you are planning on adopting a rabbit for Easter, make sure you know what you are getting into before you bring one home to the family. Should You Adopt a Rabbit? This is the first question that you need to ask yourself. Small children and bunnies are not a good match. There is a lot more care required with a rabbit than with a hamster, goldfish or other typical small pet. Thousands of bunnies are dropped off at shelters or released into the wild when their owners get bored with them or decide that the required care is just too much work. Unfortunately, pets that are released into the wild rarely make it more than a few days because they just don’t have the instincts to find food, shelter or survive. They are born, raised and kept in cages or hutches the entire time. They just aren’t built to last in the woods. If you are thinking about adopting a rabbit, it is important to understand that this is an approximate ten year commitment and is not to be taken lightly. Rabbits require a lot of maintenance, including care and proper feeding as well as a regular veterinary check-up, just like a dog or a cat. Bunnies must be handled with care, as they can be easily injured; children must be supervised while handling them at all times. Rabbits must live inside the house with the family if they are going to be a pet; not outdoors in the weather, especially here in New England. Bunnies can be costly, including the special diet, a specific type of enclosure, and trips to the local animal hospital in Dartmouth. Rabbits are very social and require lots of attention; you must be willing to spend a lot of time with care and feeding, as well as time just hanging out, playing together and bonding with your new pet. If you have weighed all the pros and cons with regard to keeping large and small rodents as pets and you are still interested in adopting a bunny rabbit, check into your local shelters to find out if there are any rescued pets available. You can also speak with your veterinarian at the Anchor Animal Dartmouth vet hospital to find out if they know of any rabbits available for adoption. Choosing to adopt a bunny after the Easter holiday might even be something that you can decide on as a family, to rescue a discarded rabbit that was previously adopted by someone who didn’t do the research and wasn’t prepared for the required care. Wherever you adopt your new pet, make sure to bring them to the animal hospital in Dartmouth for a start-up veterinary check-up. The doctors here can help you and your new friend start off on the right foot with a clean bill of health. Do all you can to continue learning about proper bunny care. Read books, do research online and speak with your veterinarian about tips for keeping small rodents as pets and specific rabbit care and feeding recommendations. Remember, a rabbit can live as long as a dog, so it is important to be prepared to commit to a long-term relationship with your new friend and to give him attention each and every day. Come visit Anchor Animal Hospital in Dartmouth to learn more about all of the services we provide to pets and pet owners in the South Coast region. From regular veterinary check-up appointments to emergency services and long-term treatments, Anchor can help you and your pet to get the best-possible care in Southeastern Massachusetts. Give us a call at 508-996-3731 to schedule an appointment or to ask questions about our services.